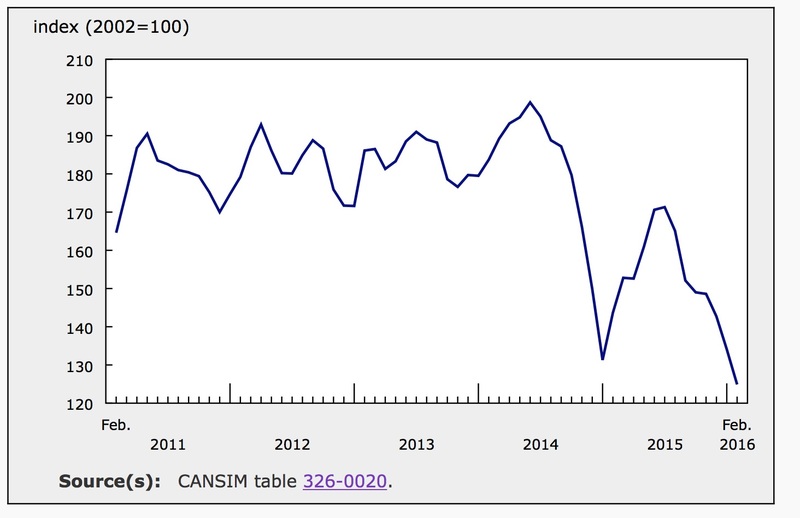 Statistics Canada surprised markets this morning with unexpectedly weak inflation data. According to their report, consumer prices climbed 1.4% for the year ending in February. This is a notable slowdown from the 2.0% annual rate posted in January. On a monthly basis, the Consumer Price Index (CPI) gained 0.2% in both January and February prior to seasonal adjustments. With gasoline prices tumbling and the Looney strengthening, economists had expected annual inflation to fall to 1.5%, including a 0.4% monthly growth rate. Core inflation slowed marginally in February, gaining 0.1% compared to 0.2% in January with seasonal adjustments. Annual core inflation slowed to 1.9% in February from 2.0% in January. Core inflation is considered a better indicator of underlying trends as it excludes items with volatile prices. February’s core CPI data indicates that the economy may be weaker than expected. Economists had expected core prices to gain 0.5% in February. With seasonal adjustments, consumer prices fell 0.2% in February to reverse January’s 0.2% growth. Core prices inched up a seasonally adjusted 0.1% in February compared to 0.2% in January. The graph below shows monthly seasonally adjusted inflation making a slight correction in February. Four of the eight major components of the consumer price index were higher in February; two posted no change; and two major components contracted during the month on a seasonally adjusted basis. The index for transportation posted the most significant monthly decline (1.1%) in February as gas prices slipped 6.9%. Gasoline accounts for approximately 3.8% of the CPI and is a major component of the transportation index. The cost of food climbed 0.3% in February compared to 1.5% for the previous month. At grocery stores, prices were up 0.2%. Declines in the prices of fish, seafood, meat, bakery and cereal products were offset by higher prices for fruits, vegetables and eggs. The index for food purchased from restaurants increased by 0.3% in February, adding to a string of similar monthly gains. The shelter index also continued to climb steadily, up 0.1% for the month. Tenants’ insurance premiums jumped 0.7%, reversing a decline of the same amount in January. Homeowners’ home and mortgage insurance fell 0.5% after spiking by 1.1% in December. For the year ending in February, prices were higher in six of the eight major components of the Consumer Price Index. Food and shelter posted the largest increase while the indexes for both transportation and clothing and footwear declined. The price of food was up 3.9% on an annual basis as the price of food purchased from stores climbed 4.4% and the price of food purchased from restaurants grew 2.7%. Higher food prices have largely been the result of fresh produce becoming more expensive across the country. The indexes for fresh fruits and vegetables climbed 10.8% and 13.7% respectively year over year. The index for shelter, which accounts for 26.8% of the CPI, increased by an annual 1.2% in February and 1.1% in January. Homeowners’ home and mortgage insurance was up 6.9% for the year while homeowners’ maintenance and repair costs were 3.5% higher. The index for household operations, furnishings and equipment gained 1.8% over the 12-month period ending in February, including a 4.5% jump in the index for household equipment. The transportation index fell an annual 0.5% in February, a notable decline from January’s 2.2% increase. Year over year, the gasoline index was down 13.1% after posting annual growth of 2.1% in January. The graph below shows the index for gasoline prices across the country over the past year. The clothing and footwear index declined 1.3% for the year ending in February as clothing prices slid 1.9% and footwear prices were down 0.8%. The price of jewelry, included in this index, increased by 3.8% over this period. In January, the clothing and footwear index fell an annual 0.3%. Inflation slowed in every province in February compared to January as the price of gas was lower across the country. Year over year, New Brunswick posted the highest annual rate of inflation in February as the price of food grew 4.6% compared to the national average of 3.9%. New Brunswick also implemented a cigarette tax in February and the index for alcoholic beverages and tobacco products was up 4% compared to 3.6% for all of Canada. British Columbia also witnessed above average inflation for the year ending in February as the gasoline index in that province did not decline as significantly year over year (down 9.4% versus 13.1% for all of Canada). 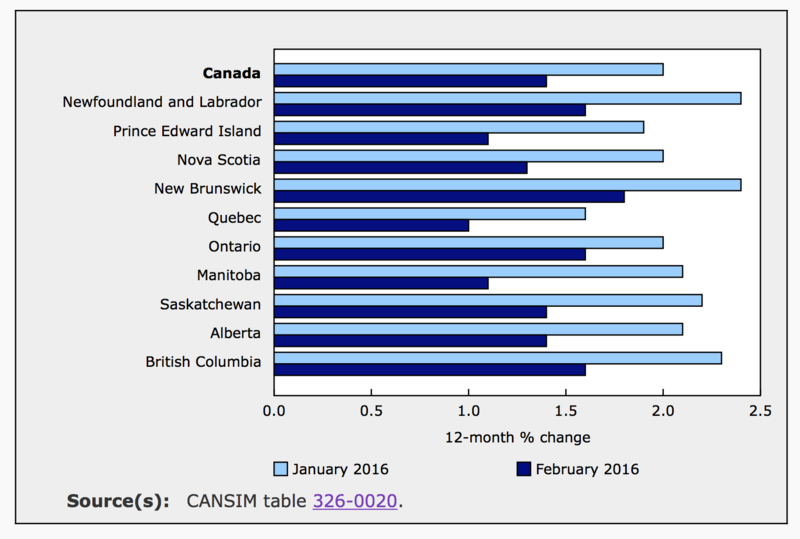 Quebec experienced the lowest rate of inflation (1.0%) of any of the provinces for the year ending in February. The index for services grew by 0.7% in Quebec versus 1.6% for all of Canada. Inflation was below average in Manitoba as well, up 1.1% year over year. The gasoline index fell 17.4% in that province. Today’s report indicates that there may be more excess capacity in the economy than previously thought. 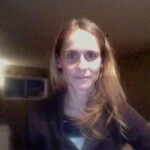 Oil prices remain low and the structural changes necessary to move to a less oil dependent economy will take time. A stronger looney will also damper inflation as imports once again become cheaper. 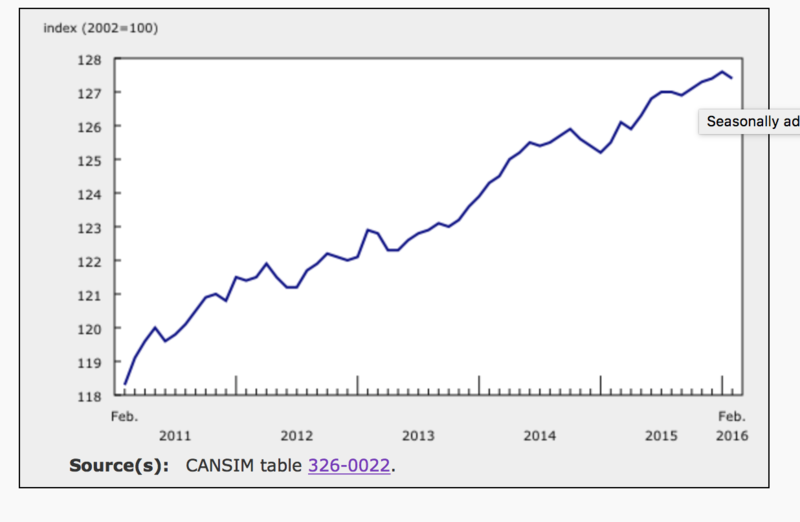 However, today’s retail sales report was the strongest in over 5 years and suggests that Canadian consumers are starting to gain confidence in the future of the economy.